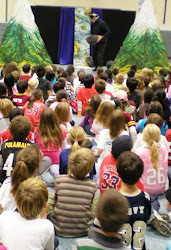 Puppets, music, and hula bring to life legends & children’s tales from the islands. The introduction to the show includes an Aloha song and a simple hula, Pearly Shells, that will be taught to the audience. The first tale is a folk legend about a magical dog, Pua Pua Lena Lena. At the request of his master to get him some awa tea, Pua Pua Lena Lena gets caught picking the best plants from the royal gardens without realizing he is in the wrong place. To make up for his mistake, the queen orders him to rescue the royal conch shell from mischievous night spirits, the Uhane, that have stolen it. Pua Pua Lena Lena must use his shape shifting skills to outwit the imps and return the important shell to the village. The second tale is a modern children's story from the book, Kai the Opihi Gets the Point by Gail Omoto and Jan and Judy Dill. It is about an opihi and the aquatic life on a rocky Hawaiian shore. An opihi is a shell fish that clings to the rocks. Kai the opihi has a problem. Unlike all the other opihi with pointed shells, his shell is flat! Many ocean friends visit him and offer advice on how to get a pointed shell. Puhi the morey eel, Honu the turtle, He'e the octopus, Papa'e the crab and Iwa the frigate bird all try to help Kai. Finally his Tutu (grandmother) solves the problem by giving Kai good advice. Kai has to learn to face his fears and stand firm against the waves. When he does he gets his point.